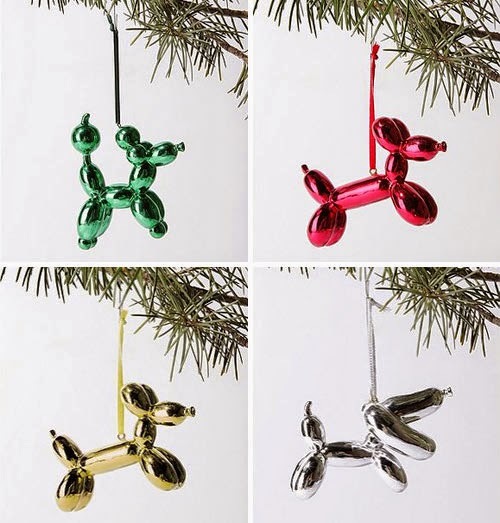 looking for our metallic balloon dog christmas tree ornaments? love dogs and balloon dogs? with our 4-color balloon christmas tree dog ornaments; we've got what you need. the complete set of four ornaments as pictured, one of each color! includes red (1), green (1), silver (1) and gold (1). balloon animals are fun and they look even better on your tree, especially when they don't ever deflate! these fantastic balloon animal dogs were inspired by the balloon animal figurines you can create by twisting and turning the special balloons into shape. balloon animals can be created in all shapes: monkeys, giraffes, turtles and so on. this one being in the shape of a lovely pup and finished with a shiny metallic coating. our beautiful balloon animal tree ornaments are simply irresistible. this set includes four (4) balloon animal dogs. all ornaments are intricately detailed for plenty of personality. each balloon ornament is topped with a metallic finish and loop for hanging. this balloon animal set will not only be the most beautiful and unique tree ornaments on your tree this season, it also makes for a great gift. ultra bright color, modern, smooth and rounded elements and a healthy dose of youthful exuberance make this theme high-octane holiday fun. price is for the set of 4 (four) ornaments. limited supplies available on these popular balloon animals so get them while you can.